GOURMET is a platform on which simulation programs run. 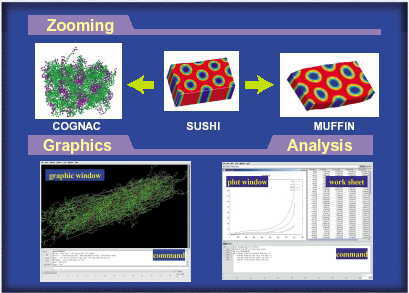 GOURMET provides a common graphical user interface for all simulation programs. GOURMET is an editor of the input data, a viewer of the output data, a tool to make graphs and animations, and most importantly a place for various simulation programs to meet and exchange the information they have. These services can be customized and enhanced by users. New simulation programs can be easily connected to GOURMET by writing the input and output files in a certain text file format.